Flaky Apple Pie recipe by Afshan Nasir Alam at DesiRecipes.com. 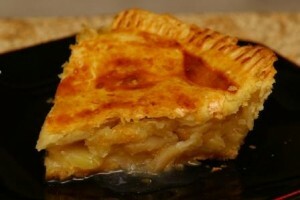 The best apple pie recipe for those who want an old-fashioned, perfect tasting apple pie with a flaky crust. Mix the margarin and flour well in cold water and kneed. Keep in fridge for 10-15 minutes. Then divide this in to two portions. Take one portion and streached thin in a round shape. Grease the frying pan and put this streached roti in to it. Peel the apple , cut in to small pieces and mix with sugar , jaifal , kishmish , and margarine and spread this mixture on the roti. Streached another portion and place it over the spreaded mixture. Close the outer ring with beaten egg, make few holes in the roti for steam to come out. Bake in preheated 180c oven for one to one and half hour. There are 5 comment(s) for this recipe. its nice n making easy. To anonymous Jaifil is nutmeg (mabe you should click on the name 'jaifil' to go to a link giving you the meaning). Margrain is margarine. I think everyone can make mistakes. It seems to me that you are here to point out every mistake just for the fun of it. HI JAIFAL IS A SPICE, GO AT THE STORE AND ASK ...U WILL GOT INSHALLAH.